So how do you dress for a job?….or an internship? When you’re used to wearing jeans and tee for daily classes and suddenly you have an internship or a possible job interview or even a job. How do you dress? It’s a good question for anyone who reached fashion awareness less than 20 years ago. That means anyone over 30 years old hasn’t seen any sort of polished, finished, coordinated and especially pretty (for females) handsome (for men) look. That’s why these questions are needing answers. In my local paper is a good article on this. Here is their example, which is pretty good considering we have come from this….. This is the standard for what has passed for fashion for the last 20 years and it’s no wonder that the question should be asked and answered, with the above as the model for “fashion”! That said, we are entering a time of more beauty and sanity in fashion. Things are turning pretty, and that means office wear. For anyone who studies art and art trends, they are almost always the herald of movements to come. For example, it was the Romantic painters, writers, and musicians who brought us the sense of individualism that led to a feeling of nationalism…..this in turn in history led to many revolutions such as the French Revolution and much later the Russian Revolution. The point here is that art precedes what happens in history, and as art did with the Grunge movement, it is again doing with the movement away from Grunge. We may not know the name of it yet, but it’s here and we’re at the start of it. This article on dressing for work proves it. And so art looking to forewarn us of what’s to come, we can also look to art on how to dress. 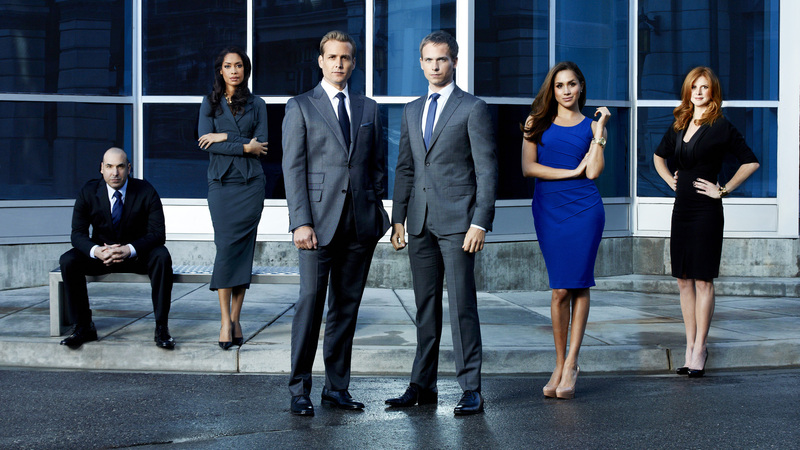 A great place is TV shows and none better than Suits. And this covers the whole gambit from boss lady, head gunslinger, junior gunslinger, wannabe runner, brilliant ingenue (who knows more than almost everyone except) and the executive assistant. Notice how everyone is dressed up – no jeans, no tees, no casual wear, no flip-flops, no hoodies…..only suits and dresses. Take note – this is what’s coming. And if you’re thinking – gee, I can’t wear that stuff because 1.) I don’t have a figure like that, 2.) I’m not any of those people, 3.) I’m retired and it doesn’t pertain to me and 4.) I’m a SAHM and I have no use for these clothes. Forget that. It matters. Don’t think simply because you think it doesn’t matter or doesn’t pertain to you (that’s old fashioned thinking) you shouldn’t be aware of what’s coming. Be aware…..be VERY aware. It will permeate all facets of life. That means no more warm-ups in the carpool line. That means no more slouching around the house in pj’s cause you’re retired. That means even if you work at home, it’s time to stop and get dressed, and even if you work for one of those forward-thinking casual IT companies, you shouldn’t make an effort. As a matter of fact, if you do work there and make the effort, you’re going to be shocked at how much legitimacy making at effort at dressing well will make for you and your career. OK – Changing gears a little with another article in today’s paper…..Minimalism. I have a real problem with this word – like Grunge (which very much adequately described the fashion movement) movement – that ugly was the new beautiful. No ugly is ugly and beautiful is beautiful. Renaming ugly to make it beautiful is ridiculous. The same is true of minimalism. Let’s face it – less is not more. Less has never been more. It’s like ugly is not beautiful. And in my mind, we all want more and to be beautiful. But here’s the difference that minimalists fail to make and this is my big beef. Edited is different from minimalist. Minimalist means that you have the very minimum you can live with. That sounds a little like a bunker mode. I’m not in bunker mode and I choose what I want which is not bunker mode. However, I do highly edit what I want. And clothes have to earn their way into my closet. I may have the same amount of outfits that the minimalist does, but my closet is well-edited. It’s highly discriminatory and very elitist because clothes must not only earn their way into the closet, they constantly have to earn their place in the closet or they are removed. Minimalism sounds like some nihilistic philosophy, while well-edited sounds as though I’m in charge not some set of rules. The rules that I make are the rules that my closet has to obey, not the rules that some austere, bare philosophy makes. OK – glad I got those two subjects off my chest….comments, as always are welcomed!!! !